A UW Health staff member shares his experience with "doing too much too soon." One spring, as the heavy weight of a Wisconsin winter relented to warm breezes, a friend of mine decided to wipe away a few lethargic months in one energetic swoop by going for a run. Not quite 40 minutes later he returned home, and with the help of mapmyrun.com, determined he ran about 4.1 miles. Not Olympian, but not too shabby, particularly because he hadn't run in many months. As he re-hydrated, while trying to ignore the increasing tightness in his calves and thighs, my friend indulged in that fatigued satisfaction that accompanies the accomplishment of a physical goal. Full disclosure: That "friend" wasn't a friend at all. It was me, and I was so sore I couldn't walk without a pronounced hobble for three days following the run. According to UW Health Sports Medicine physician John Wilson, MD, I probably wasn't alone. Dr. Wilson estimates that roughly half of the patients he sees at the Sports Medicine Clinic are recreational athletes whose athletic ambition triumphed over common sense and sound exercise planning. "They try to do too much, too soon," Dr. Wilson says. Such an approach often leads to overuse injuries that stem from engaging in repetitive activities without allowing the body sufficient time to heal. Joggers who leap off the couch directly into a 10-k are at risk for Achilles tendonitis and patellar tendonitis. Aspiring Rafael Nadals who go five sets without having picked up a racket in months are prone to tennis elbow. "As the weather gets nicer, some people start to resume more active lifestyles," Dr. Wilson says. "And they may not have been exercising in a while. They try to make up for lost time." Many overuse injuries will heal on their own if athletes pay attention to their bodies' cues. Dr. Wilson suggests the RICE approach - Rest, Ice, Compression, Elevation - as an effective way to deal with the aches and pains of a rejoined exercise regimen. Better yet, before returning to exercise, athletes should construct a sensible strategy that allows them to ease into the work. "For any new activity, I would recommend proceeding cautiously and gradually," Dr. Wilson says. 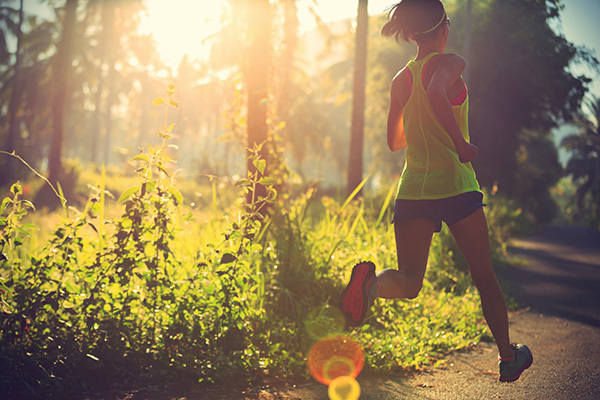 "Start with a low-intensity, low-duration (routine), and build up your strength and stamina." A 10-20 percent increase with each advancing week is a reasonable pace. Instead of launching right into a four-mile run, I would have been better served starting at a mile or so, and then bumping the distance to 1.2 miles the following week, and incrementally thereafter, making certain I gave my body adequate rest between runs. If aches and pains persist for weeks rather than days, Dr. Wilson suggests seeking a physician's counsel, to "make sure nothing more serious is going on." Runners, in particular, often misinterpret nagging pain as something fairly benign, like shin splints, when it could be more worrisome. "Some athletes haven't been running over the winter," Dr. Wilson says, "and assume it's a shin splint, so they keep running. But those injuries can be more serious and lead to stress fractures." Gung-ho athletes may be tempted to tough it out, but one visit to the doctor may save them weeks or months of unnecessary anguish. "If we catch these injuries early, they're easily treated with physical therapy," Dr. Wilson says. "The longer you wait and the more chronic the injury becomes, the more difficult it is to treat. You may be left with a chronic condition that makes it difficult to be as active as you'd like to be."